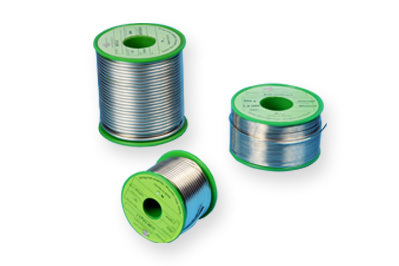 Four characteristics used to describe wire are the alloy, the diameter, the type of flux and the winding. The chosen flux can be integrated into the wire or left separate, depending on the manufacturing process and the end use. There are in fact thousands of possibilities from which METACONCEPT has selected an extensive range of consistent products suitable for all major types of applications. Waste originating from the use of these products can be recycled. Contact our recycling department to find out more. Have you defined the type of application? Contact us. Our technical staff will be happy to assist you in choosing the diameter, the type of flux and the alloy. With standard dies it is possible to create wires with a minimum diameter of 0.3 mm and maximum diameter of 6 mm. The main intermediary values are: 0.5, 0.7, 1.0, 1.5, 2.0, 2.5, 3.0, 4.0 and 5.0 mm. Weight of commonly used spools: 100 g, 250 g, 500 g, 1 kg, 2.5 kg, 5 kg and 20 kg. For high volume industrial applications, 25 kg, 30 kg and 100 kg containers are also available. The type of spool used varies depending on the desired volume. For standard uses, AMPRA spools are preferred. However, for intensive industrial uses, DIN spools are recommended. The following tables list the spools and their dimensions depending on the net weight of the packaged wire, as well as the standard packaging. The product safety datasheet below is available upon request to the METACONCEPT Group. In the case of a solid wire (non-fluxed), the parts must be clean, degreased and deoxidised. First, apply the appropriate flux to the parts. Heat the parts using a propane or acetylene torch, or a soldering iron. The parts must be heated to around 20°C above the liquidus temperature. Melt the filler metal onto the parts being assembled to form a regular bead. Allow the parts to cool without moving them. When the parts have returned to room temperature, brush the soldering beads using a metallic brush. If necessary, clean the assembly with clean water or water with a touch of citric or formic acid (1 to 2 %) in the case of water-soluble residues. Use a solvent for residues from rosin or resinous fluxes. In the case of a flux-cored wire (integrated flux), the fluxing stage described above is not always necessary. These wires may also be used with an automatic soldering machine. In this case, the diameter of the wire must be perfectly adapted to the diameter of the nozzle. In addition, it is advisable to use a wire where the % of flux is greater than that used for manual soldering. Always use a flux suited to the intended use. Contact our technical department to ascertain which product is most suited to your application.All of the information contained in this document is provided for informational purposes only and the METACONCEPT Group will not be held liable for it.